Title page and frontispiece only. 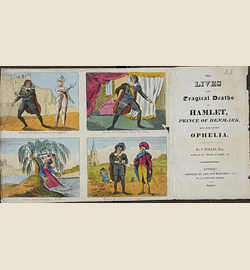 Hand-coloured frontispiece probably by Robert Cruikshank. Copy in McGill Library's Rare Books and Special Collections: 1 in a collection of 57 title pages and frontispieces from 1820 to 1828 that represent a better technique than some earlier examples as the strong colours are not applied as carelessly as some of the earlier and cheaper booklets; accession number: 359087.
text.chapbook.black and white, 19 cm.